Solution: Consider the Lewis structure for the polyatomic oxyanion shown here, where X is an element from the third period (Na-Ar). By changing the overall charge, n, from 1- to 2- to 3- we get three different polyatomic ions. For each of these ions identify the central atom, X. 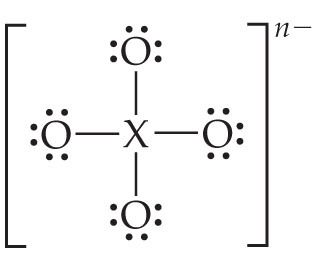 Arrange your answers in order increasing n.
Consider the Lewis structure for the polyatomic oxyanion shown here, where X is an element from the third period (Na-Ar). By changing the overall charge, n, from 1- to 2- to 3- we get three different polyatomic ions. For each of these ions identify the central atom, X. Arrange your answers in order increasing n.